Maritime archaeologists have discovered a Phoenician shipwreck dating to 700 BC off the coast of Malta. A new study of the Timna copper mines shows that the workers in the 10th century BC were not slaves but highly skilled craftsmen. Corinthian Matters has a review of a field trip app that accompanies the ASCSA’s new Ancient Corinth: A Guide to the Site and Museum. Ferrell Jenkins describes his recent visit to the Louvre in Paris. Tiberias—There’s More to See than Just Hotels. Yes, indeed. Leon Mauldin visits the other Bethlehem. This lesser-known biblical site is in Galilee. Clyde Billington is on the Book and the Spade this week discussing the “stone rejected by the builders” along with the use of tokens for counting. Accordance has a sale now on a five-resource bundle from Rose Publishing, including their guides to the tabernacle and temple. Paul L. Maier’s Pontius Pilate is marked down to $2.99 for the Kindle. I recommend it. “The biblical stories become real when people adopt them as their own, regardless of their historical accuracy” (Cline 2007: xiii). So what is not real becomes real when we make it real. In our day and age, it really is all about us. “The truth of the matter is that any such searches for Noah’s ark are unlikely ever to be successful. Even if the ark did exist, it would be tremendously old by now and its wooden parts would have been long ago reduced to dust, leaving few traces behind. The most we could hope for would be discovering something like the Sutton Hoo ship in England from the seventh century A.D.; the disintegrated wood and corroded nails from this vessel left a perfect imprint on the damp soil. Only if the ark had come to rest in the sands of Egypt, which contain perfectly preserved pharaonic boats by the Pyramids, or at the bottom of an ocean or a sea where there is little oxygen and organic material is perfectly preserved—such as in the Black Sea, where Bob Ballard’s expeditions have found ships sunk up to their gunwales and perfectly preserved in anoxygenic mud—would we even be able to hope that Noah’s ark, or portions of it, have been preserved” (Cline 2007: 36). But as long as there is fame to be had and money to be made, there will be searches for Noah’s Ark. “Modern archaeological techniques are quite capable of tracing even the very meager remains of hunter-gatherers and pastoral nomads all over the world” (Cline 2007: 85). Perhaps, but entire centuries are missing from the archaeological record in some places. “Of the various alternatives, following the biblical chronology and placing the Exodus in the 15th century B.C. seems the most unlikely, but some will want to do that anyway, based upon faith rather than reason” (Cline 2007: 90). Those I’ve read who advocate a 15th-century exodus always appeal to evidence and arguments, never to faith. “Finkelstein said, ‘I am a great believer in a total separation between tradition and research. I myself have a warm spot in my heart for the Bible and its splendid stories. During our Pesach seder, my two girls, who are 11 and 7, didn’t hear a word about the fact that there was no Exodus from Egypt. When they are 25, we will tell them a different story. Belief, tradition and research are three parallel lines that can exist simultaneously. I don’t see that as a gross contradiction’” (Cline 2007: 91). For thousands of years before our post-modern advances, we would call this lying. “The team also cited both its own studies and those of other researchers who believe the story of the damming of the Jordan River can be traced back to a 1931 book published by John Garstang. The book is, as the article stated, ‘the only source reporting about the Jordan’s damming at Damiya.’ The team of earthquake experts strongly suggests that Garstang’s testimony is unreliable, especially since he was not even in the country at the time and since no other sources, including official police reports or press releases, mention a damming of the Jordan River. They speculate that Garstang’s desire to prove that Damiya is the biblical ‘city of Adam’ and his desire to show that the Jordan could have stopped flowing as a result of an earthquake affected his reporting” (Cline 2007: 105). Unless you know of other evidence, you should not cite the dubious testimony of Garstang. “In a candid article, Younker said that the ‘Andrews Way’ of doing archaeology, as he phrased it, is as follows: 1. Be forthright with findings. Do not minimize problems or stretch interpretations of data to explain things away. 2. Do not make claims beyond what the data can support. 3. Be quick and complete in publishing results. 4. Engage and work within mainstream scholarship. 5. Include a diversity of people and specialists. 6. Take the history of the Bible seriously, but do not place upon archaeology the burden of ‘proving’ the Bible” (Cline 2007: 187). This helpful approach is given in Randall W. Younker, ‘Integrating Faith, the Bible, and Archaeology: A Review of the ‘Andrews University Way’ of Doing Archaeology,’ in The Future of Biblical Archaeology: Reassessing Methodologies and Assumptions, eds. James K. Hoffmeier and Alan Millard (Grand Rapids: Eerdmans, 2004), 43-52. Cline’s newest book, 1177 B.C. : The Year Civilization Collapsed, came out earlier this year. Esarhaddon was an Assyrian king noted in Biblical passages such as 2 Kings 19:37. He erected the monument shown in the picture to commemorate a military victory in Egypt. The dolerite monument is over ten feet high and was made in the 7th century BC. It was found in 1881 in the modern city of Zinjirli, Turkey, and the text is written in the Akkadian language using the cuneiform script. Esarhaddon himself is depicted in the carving, which is now located in the Museum of the Ancient Near East, Pergamum Museum, Berlin. Esarhaddon was a powerful Assyrian king during the 7th century BC, and King Manasseh of Judah was a vassal ruler under his sovereignty. 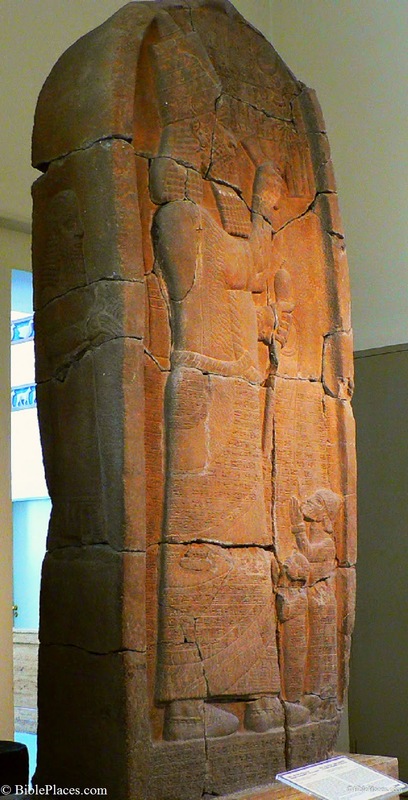 In the royal inscriptions of Esarhaddon (not shown here) reference is made to "Manasseh, King of Judah," who was required to help provide building material to Esarhaddon for the construction of the Assyrian ruler's palace. For information on similar artifacts related to the Bible, see Bible and Archaeology - Online Museum. The Satellite Bible Atlas now has a Canadian distributor. Until now, shipping to Canada from the U.S. cost nearly as much as the book itself. The Family Christian Bookstore in Ontario now sells the atlas, and shipping charges are much more reasonable to Canadian addresses. The Bible Lands Satellite Map is also available. On Tuesday, September 16, Trinity Evangelical Divinity School in Deerfield, IL will present the fall lecture in its “Trinity Biblical and Ancient Near Eastern Archaeology Lecture Series.” William M. Schniedewind (UCLA) will speak on the topic “Early Hebrew Scribes — When Israel Began to Write.” The lecture begins at 7:00 p.m. and will take place in Hinkson Hall, Rodine Building. The event is free and open to the public. SourceFlix has produced a short video illustrating Psalm 23. Wayne Stiles has everything you want to know about Timna Park, including photos, a time-lapse video, Google Street View, and a map. The Getty Thesaurus of Geographic Names is now online for free. If you’re thinking about visiting the Pergamum Museum in Berlin anytime soon, read Ferrell Jenkins’ recent post. A copper awl discovered not far from Beth Shean is now believed to be the oldest metal object known from the Middle East. The University of Haifa press release is online here. The new editors of BASOR have penned an inaugural letter describing their plans and offering an invitation. Jordan’s Tourism Board has launched a new online chat service. I came across this notable observation yesterday when looking over some photos in Earthly Footsteps of the Man of Galilee. The Grand Mosque of Damascus is one of the most interesting buildings in the East. It is quadrangular in form, one hundred and sixty-three yards wide, by one hundred and eight yards long. A lofty wall of fine masonry surrounds it. A few years ago the building was almost destroyed by fire. One of the most wonderful things about this mosque is an inscription which is pointed out to the tourist. It runs over an arch in the second story. You can see even in this picture the Greek letters which form the following sentence: "Thy kingdom, O Christ, is an everlasting kingdom, and Thy dominion endureth throughout all generations." This is the Septuagint rendering of Psalms, cxlv : 13, with the simple addition of the name of Christ. What a curious inscription to find on a Moslem mosque! And yet, how true it is that the kingdom of Christ is an everlasting kingdom. To-day the power of Mohammedanism is waning. A 2010 article in the Wall Street Journal gives the history: Muslims reused stones of the church they razed. The builder of the mosque, al-Walid, was also responsible for the construction of the Al Aqsa Mosque in Jerusalem. Unfortunately the last observation in the quotation above has proven false. But that is in accord with Scripture which speaks of the numerous enemies present on earth when Jesus returns (Ps 2; Zech 14; Rev 19). 11:00-11:45: Assaf Kleiman, Dating the Aramaean Campaigns to the Southern Levant: A Gradual Process of Destructions? 14:30-15:15: Manfred Oeming, “And the King of Aram was at War with Israel"– The Construction of the Aramaean as an Enemy in the Elisha Cycle 2 King 2-13. The program is available in pdf format here. Another topic that seems relevant to this conference: Textual Witnesses to the Aramean Oppression of Israel in the Late Ninth Century. And another: Archaeological Evidence for the Aramean Route to Philistine Gath. I’ve written on both in my dissertation. Anna Moseley Gissing writes about three lessons she learned from archaeology about the spiritual life. Haaretz reports that the appointment of Israel's new antiquities chief is embroiled in politics. Should the Vatican return the menorah from the Jerusalem Temple? Steven Fine assigned his class the task of refuting the notion that the Vatican has it. Camels Mummification existed in Egypt 1,500 years earlier than scientists have long believed. The Egyptian government has asked the Ashmolean museum to lend it the personal collection of Howard Carter. Brian Daniels discusses Preserving Culture in War on this week’s broadcast of The Book and the Spade. What is the relationship between the archaeology of Jerusalem and the Book of Mormon? SourceFlix has produced a new video that answers this question. Wayne Stiles describes two oases along the shore of the Dead Sea. (Can you guess which ones they are? Neither one ends with “Gedi.”) He includes photos, a video, and a map. Archaeologists around the world, who have long relied on the classic tools of their profession, like the trowel and the plumb bob, are now turning to the modern technology of drones to defend and explore endangered sites. And perhaps nowhere is the shift happening as swiftly as in Peru, where Dr. Castillo has created a drone air force to map, monitor and safeguard his country’s ancient treasures. Drones mark “a before and after in archaeology,” said Dr. Castillo, who is also a prominent archaeologist and one of a dozen experts who will outline the use of drones at a conference in San Francisco next year. In the Middle East, researchers have employed them to guard against looting. “Aerial survey at the site is allowing for the identification of new looting pits and determinations of whether any of the looters’ holes had been revisited,” said Morag Kersel, an archaeologist from DePaul University in Chicago who is part of a team using drones in Jordan and Israel. Though his work is focused on the deep past, Dr. Castillo is fascinated by gadgets and new technology. He began experimenting with drones about two years ago, buying a $100 one from the Sharper Image. Now he has a squadron of eight, all miniature helicopters that cost about $1,500 to $20,000. He hopes to soon add 20 more. “Finally you can fly whenever you want to, wherever you want to, in any angle, for anything you want and get the great picture you always thought you should take,” he said. The full story focuses mostly on the use of drones in Peru. Aren Maeir recently posted a video showing a drone in use in his excavations of the Philistine city of Gath. We’re all familiar with the kinds of archaeological research seen in movies and television — digging the earth, brushing the dust away, and examining artifacts up close. But these days, we can learn even more about ancient artifacts by combining traditional archaeology with cutting-edge technology. At the Hebrew University’s Institute of Archaeology, researchers were curious to know more about a type of storage container that began appearing around the late 10th or early 9th century BCE. Due to their large swollen bodies, they are dubbed 'Hippo' jars. To probe the deep secrets of these ancient jars, the researchers — Prof. Amihai Mazar, Prof. Uzy Smilansky, and Dr. Avshalom Karasik — went beyond traditional techniques by conducting a series of scans with 3D scanners and advanced computation. Equipped with modern, high precision scanners, the lab created detailed three-dimensional models of the 'Hippo' jars. These digital models provided precise measurements of the jars’ shape, which was later correlated with independent features, such as the source of the clay used to make them, the potters’ marks, and the jars’ distribution. They also provided information on the jars’ capacity, volume, height and maximal diameter. What did the researchers learn from the 3D scans? The article continues here. This is the first in a new column written by students at the Hebrew University’s Institute of Archaeology. The museum has a collection of small, bowl-shaped olive-oil lamps made from clay, through more elaborate closed lamps of metal. The lamps date from the earliest periods of Canaan's history, including the Neolithic and Chalcolithic eras to the early Bronze Age, or sometime before 3200 B.C. to 2200 B.C. "It helps people to see how styles change over time," he said, and added, "When you're digging at an excavation, that's one of the things that helps you date what you're finding." Other items in the collection include various types of clay storage jars, which were probably used for water, wine or grain. "These were the kitchen cabinets of the Old and New Testament periods," Sarah [Dorsey] Bollinger added. "The strength of our collection is in what everyday life was like. We don't have lots of extraordinary or exceptional types of things. We do have a lot to do with writing." The museum is divided into two rooms, one for the Old Testament and one for the New Testament. In the hallways between the two rooms there are many artifacts to see as well. One of the oldest pieces in the collection is a tiny arrowhead that dates to the sixth century B.C. "It's a flint arrowhead from Jericho; it's 8,000 years old," Phillip Bollinger said. "Probably used for hunting very small game." Other interesting objects include a 4,000-year-old milk churn, make-up containers made of bone or metal, garment holders, jar handles with King Hezekiah's seal, as well as weapons such as slingshots of the type that David used to slay Goliath. The full article includes a slideshow and video. The official website is here. For other museums in the U.S. with artifacts related to the biblical world, see our list here. A new study explains why some Herodian stones in the Temple Mount of Jerusalem are well preserved after 2,000 years while others are eroding severely, creating concerns about the wall’s stability. Visitors to the Western Wall in Jerusalem can see that some of its stones are extremely eroded. This is good news for people placing prayer notes in the wall's cracks and crevices, but presents a problem for engineers concerned about the structure’s stability. The Western Wall is a remnant of the ancient wall that surrounded the courtyard of the Jewish Temple in Jerusalem. It is located in Jerusalem’s Old City at the foot of the Temple Mount. To calculate the erosion in the different kinds of limestone that make up the Western Wall, researchers from the Hebrew University of Jerusalem used a laser scan to create an accurate three-dimensional computer model. 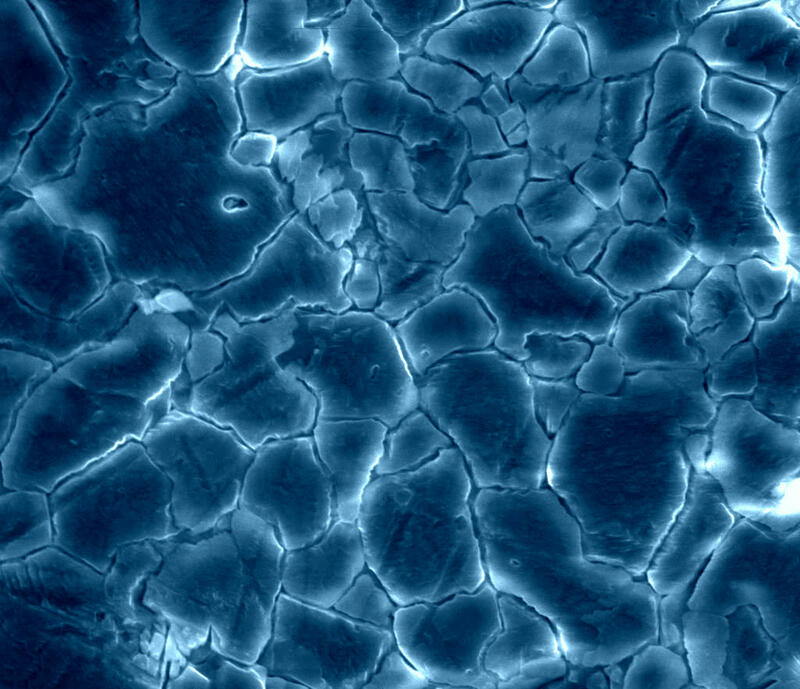 The researchers are Dr. Simon Emmanuel, the Harry P. Kaufmann Senior Lecturer in Environmental Water Technology, and PhD student Mrs. Yael Levenson, at the Hebrew University’s Institute of Earth Sciences. As reported in an article accepted for publication in the journal Geology, they found that stones made up of relatively large crystals were resistant to wear, so that they were almost unchanged in the 2000 years since they were originally put in place. By contrast, limestone with very small crystals (about one thousandth of a millimeter in size) eroded far more quickly. In some cases, extreme erosion rates in fine-grained micritic limestone blocks were up to 100 times faster than the average rates estimated for the coarse-grained limestone blocks. In some places these stones had receded by tens of centimeters, potentially weakening the overall structure. To understand what causes the two types of rock to behave differently, the researchers collected samples from ancient quarries thought to have supplied the stones for the Second Temple. Using a powerful atomic force microscope, they were able to see how the rocks disintegrated when they came into contact with water. During the experiments on rocks made up of small crystals, tiny particles rapidly detached from the surface of the rock. These experiments simulated the way in which rain water interacts with limestone in nature. Observed for the first time in Dr Emmanuel’s lab, this process of accelerated erosion can explain why some rocks are more weathered than others. While mechanical weathering is thought to act on blocks and chips of rock at the visible outcrop scale, the researchers showed for the first time that chemo-mechanical erosion extends down to the tiny micron scale. The findings could have important implications for regional and global carbonate weathering. The research appears as “Carbonate weathering rates accelerated by micron-scale grain detachment,” in the journal Geology. The research was supported by the Israel Science Foundation. The story is also reported by the Jerusalem Post. A replica of Solomon’s Temple has now opened in Sao Paulo. But since it has the capacity to seat 10,000 people (and Solomon’s could seat exactly zero), one has to wonder in what sense it is a “replica.” This Forbes article has more info and a computer image. Google has more images. Results of excavations at Tell Jemmeh in southern Israel from 1970 to 1990 have now been published. G. M. Grena shares a list of lectures and abstracts of interest from the ASOR 2014 meeting in San Diego in November. Wayne Stiles highlights some ancient tombs in Israel that you can visit. Bible History Daily has a roundup of articles related to summer excavations. The Times of Israel has a good collection of photos of mosaics from the Huqoq synagogue. The NY Times has more on the destruction of the tomb of Jonah in Iraq. Last call for the lowest price on Logos’ Archaeological and Theological Studies of Jerusalem (10 vols.) Some of the works I’m not familiar with, but the two Warren volumes are classics. The more who order, the lower the price goes for all of us. I recommended ScrollTag several years ago, but if you missed it then, you should check it out now. The program now includes the Trainer, a unique tool that will help you learn (and remember!) Greek and Hebrew word forms. The package price is a great deal. SourceFlix has a new video with fly-overs of nine important biblical sites. BibleX shares a report from the 1880s of a visit inside the traditional house of Simon the Tanner. Robert Mullins is on The Book and the Spade this week discussing the recent season of excavations at Abel Beth Maacah. That recently discovered Iron Age gate at Lachish is neither a gate nor is it from the Iron Age. Luke Chandler explains. Ferrell Jenkins explains the importance of the Tenth Roman Legion in Jerusalem, and he follows it up with a number of photographs. Five haredim were arrested this week for attempting to block entrance to an excavation site near the Old City. IAA Director General Yehoshua (Shuka) Dorfman died on July 31 after a long illness. This summer’s excavations of Tel Gezer were successful, according to a Baptist Press report written by archaeologists Steven Ortiz and Sam Wolff. Work continued this year on the tell, in the water system, and in the regional survey. The project focused on an area west of the city gate where a casemate fortification wall was uncovered. Up against the interior of the wall was a large courtyard area with a tabun (clay cooking oven), storage jars, cooking pots, and burnt beams lying atop a plaster surface. Just to the north of this courtyard were two rooms with walls preserved to a height of more than a meter and a half. In one of these rooms the team discovered the remains of a cow jawbone. The adjoining room contained the game board. Excavations also revealed "pre-Solomonic building remains." Discoveries from this period (12th-11th centuries B.C.) included a perfectly preserved bronze spearhead, the head of a Philistine-type ("Ashdoda") ceramic figurine, and the ceramic six-toed foot of a possible feline, the team reported. Largely unexcavated remains from the Late Bronze Age (14th century B.C.) lay below. The full report is here. The Jerusalem Post article focused more on the effect of the war on the Gezer excavation. The excavation’s official website is here. The BiblePlaces website includes more photos and information about Gezer. Earlier this week, Bill Schlegel, author of the Satellite Bible Atlas, released a video about Gezer’s biblical significance and archaeological discoveries. The 4-minute video below includes new aerial photos and footage. According to Pablo Betzer and Eyal Marco, excavation directors on behalf of the Israel Antiquities Authority, “The hoard, which appears to have been buried several months prior to the fall of Jerusalem, provides us with a glimpse into the lives of Jews living on the outskirts of Jerusalem at the end of the rebellion. Evidently someone here feared the end was approaching and hid his property, perhaps in the hope of collecting it later when calm was restored to the region”. All of the coins are stamped on one side with a chalice and the Hebrew inscription “To the Redemption of Zion” and on the other side with a motif that includes a bundle of lulav between two etrogs. Around this is the Hebrew inscription “Year Four”, that is, the fourth year of the Great Revolt of the Jews against the Romans (69/70 CE). The hoard was concealed in the corner of a room, perhaps inside a wall niche or buried in the floor. Two other rooms and a courtyard belonging to the same building were exposed during the course of the archaeological excavation. The structure was built in the first century BCE and was destroyed in 69 or 70 CE when the Romans were suppressing the Great Revolt. Early in the second century CE part of the building was reinhabited for a brief period, which culminated in the destruction of the Jewish settlement in Judea as a result of the Bar Kokhba rebellion. This is attested to by three complete jars that were discovered embedded in the courtyard floor. The full story is here. The story is also reported by Arutz-7 and The Times of Israel. Pablo Betzer, IAA District Archaeologist for Judah, with a coin from the Year Four of the Great Revolt. 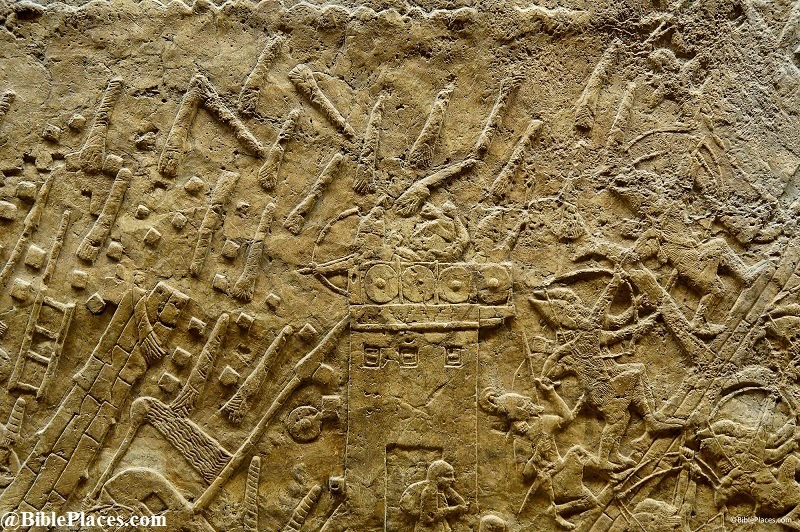 This wall relief carving depicts the siege of the Judean city of Lachish, telling the story from the Assyrian point of view. The carving was created in c. 700 BC and was discovered in the 1850s in the ancient city of Nineveh, Assyria. The full original panel measured sixty-two feet in length and was nearly nine feet tall. The events shown on the panel are also recorded in the Bible in 2 Kings 18. 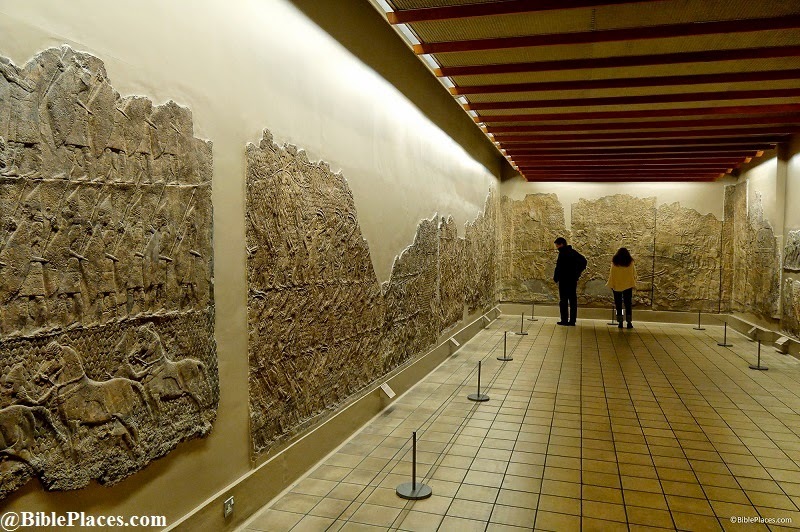 The relief now resides in the British Museum. The close-up photo shown to the right is one of the panels to this long relief. It depicts the battle between the attackers, who are using a battering ram, and the defenders who are shooting arrows and throwing burning torches. 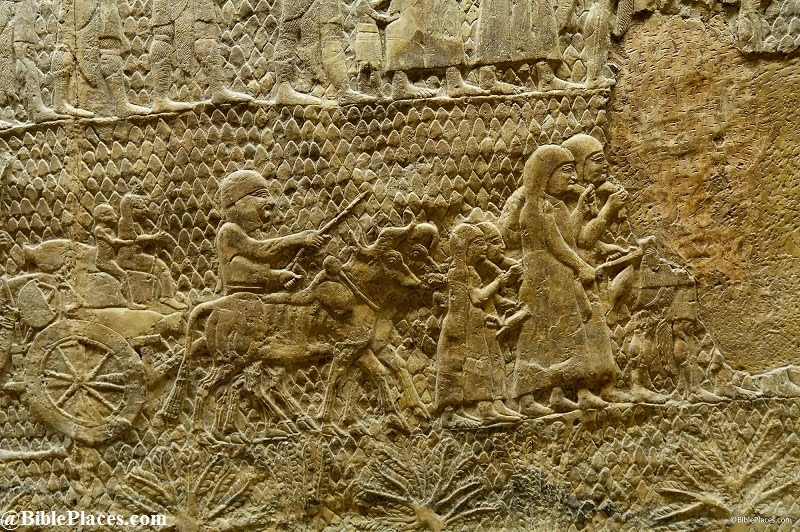 The close-up photo on the left shows Judean captives being led into exile. Other panels (not included here) show victims being impaled and flayed. All in all, despite the rather gruesome subject matter, the relief represents one of the more magnificent treasures from antiquity. It also provides support for the historicity of the scriptural record.